Let’s say you just finished building an amazing sensor. It is the product of years of research and development and is destined to change the world as we know it. You chose the best engineers who are experts in their field. You focused on every detail. You designed it to be complex yet simple. Robust yet sophisticated. 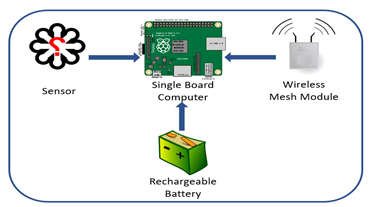 All you need to do now is connect it to the world through a wireless mesh network. Easy. Your engineers are not experts in RF so you buy a proprietary wireless mesh network module. It costs significantly more than the entire sensor but it’s got to be worth it. Right? You need a microprocessor to read and process the sensor data for transmission. The radio module has a microprocessor but you aren’t allowed to access it because it’s “vendor-locked” so you purchase an additional single board computer to run your code. The mesh radio module doesn’t have power so it requires an external power source. The power used by the RF module FAR exceeds any power estimates you had for your sensor. You also have to power the single board computer you just added. Now you will need to create a rechargeable battery circuit. In order to know how many batteries you will need, to meet your battery-life requirements, you will need to perform detailed tests on the power usage of the new system. We are ready for the enclosure. You will need to get all these things to fit inside a small light-weight container that meets your customer’s size requirements which just seem impossible at this point. You’re exhausted and running out of time so you spend a fortune manufacturing a custom enclosure. The sensor “system” is finally done. Let’s say the wireless mesh network isn’t performing as advertised or you find a cheaper product. If you change it then you will have to change everything. You’re stuck. Your sophisticated sensor is now a complex, awkward, expensive, power hungry system that can never be modified. How did you even get here? Radio module manufactures are extremely secretive and refuse to share any information they deem proprietary. They purposefully create black box modules that remain shrouded in mystery. This design creates redundancy and ultimately increases the cost, size, weight and power-usage of any system in which it is integrated. If engineers were allowed to use their microprocessor then the entire system would immediately shrink in power, size and cost. What radio manufactures don’t want you to know is that wireless mesh technologies have been around for years and include many open source routing protocols. “The Better Approach To Mobile Ad-hoc Networking” (B.A.T.M.A.N.) is an example of an open-source routing protocol for multi-hop wireless mesh networks. My company, TELEGRID, has even stopped developing a proprietary wireless mesh routing protocol due to the remarkable performance of B.A.T.M.A.N. Our uMesh wireless network allows system manufacturers to select specific components they need and MOST IMPORTANTLY write code on the same microprocessor as the wireless mesh network. System manufacturers need to break-free from the wireless mesh network black-box conspiracy. It is the only way to cut costs and size so that mesh-networked devices can finally permeate the marketplace and the world. Want more information on how to add wireless mesh networking to your product just call me at 973-994-4440 and ask for Beth!